I'm trying to figure out Another Stage, but the guide from AngelFire is gone and I have no clue what any of the options mean. 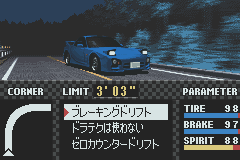 I wish there was a translation patch or a guide on GameFAQs because I seriously can't even beat Iketani. Anyone know how? Here are screencaps of some of the options and notes on what they do. 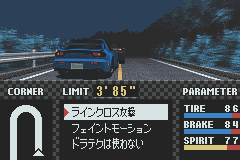 NOTE: The game will make you brake differently for fast and slow corners, so sudden braking will work for both tight hairpins and fast sweepers. 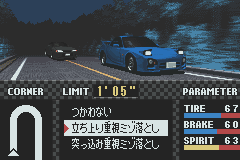 The E-brake drift only shows up on hairpins. 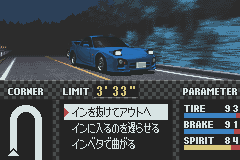 You can use it without problems even when entering a turn from the inside at high speeds since you slow down a lot during the drift, making it great for hairpin overtakes but nothing more than that. 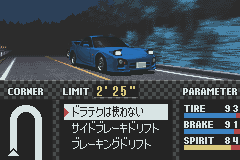 This is the first drift technique acquired in the game. If you can't read any Japanese characters, you'll have to rely on memory like I first did back when I couldn't read hiragana and katakana. Anyway, these aren't all the options, but I think they'll do for now. Hope this helps. Let me know if you didn't understand something, want a technique explained or need more help with the game. EDIT: Forgot to mention that the out-in-out line works best with normal braking. Thanks. This should be enough to help. what game is this?? what platform is it on? 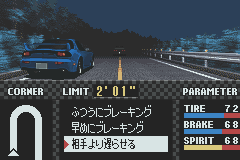 If I remember correctly, Initial D: Another Stage is a very old game for the Game Boy Advance. I believe that it came out way back in 2002, I don't know too much about the background and gameplay though. Wow, this is so cool. I'm a sucker for games like this that are less action, more thought. I wonder if it can even be found anywhere these days? And they never made a version in english, correct? That is correct. 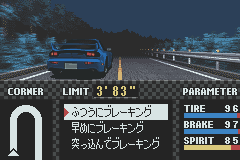 There is no english version of this game. I got my cartridge from an importer on eBay 5 years ago and I still play it. After a lot of trial and error, you will find out what options work best at certain points in each race. great list but where's teh full list?